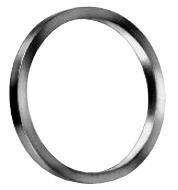 Sargent # 90 Cylinder Trim Rings, also known as blocking rings. Used with mortise locks as a spacer when the mortise cylinder projects from the face of the door and you need solid, finished blocking ring for the space. Used in conjunction with the 8200 mortise locks and also when cylinders are used with other factories mortise locksets ( for example - Adams-Rite locks on Aluminum storefront door openings). Available in thickness 1/8", 1/4", & 3/8"